This year marks the 30th anniversary of Super Mario Bros. I never really think of most Mario games when I think of my favourite video games (with the obvious exception of Super Mario 64), but they have always excelled, and I continue to buy and play them all with gusto. If nothing else, Super Mario Maker has reminded me of how much fun it is to just sit down and play some Mario. But there is so much more to it! Mario Maker is crammed to the gills with not only the tools necessary to create, distribute, and play Mario courses, but also heaping spoonfuls of pure love. Booting the game up alone is exciting for a while, as there’s a different little animation for each day of the week. The title screen is a fully playable (if basic) course, and there are plenty of secrets to find and play around with tucked in there as well. It’s not the first game to include a playable title screen, but it is absolutely the best one. Like most video games, Super Mario Maker contains a tutorial. Especially important here, because this software is a little more complicated than your typical Nintendo game. The fun part about the tutorial is that it gives you an incomplete course, and lets you loose to do as you wish with it. Sure, there are tips and suggestions scattered about, but it never forces you to complete the course in the way it recommends. I believe the only thing you must do is to try all the elements that it highlights. How you use them is entirely up to you, though. After that, you’re free to go about your business however you please. Play some courses from other makers, start working through the pre-made courses that come with the game, or head right into the creation portion to get working on your own masterpiece. At the outset, you’re given a comparatively small allotment of pieces with which to build your courses. Not even enough to build a faithful reproduction of 1-1 (you lack the Fire Flower, Starman, and warp pipes). You’re also limited to using the original SMB style or that of New Super Mario Bros, and can only access the ‘ground’ and ‘underground’ themes. New item/theme/effects packages are delivered quickly, though, if you make sure to at least try out all of the tools you currently have on hand. The limitation may seem like more of an annoyance than anything, but I was perfectly happy the whole way through, as it was fun for me to try to create interesting levels with only the few basic building blocks of the Mario universe. It challenges your creativity, but doesn’t stifle it by forcing you to work with an incomplete toolset for very long. The only true problem is that warp pipes (and a sub-area) are the very last thing that is unlocked, and like a stubborn child, I wanted them right now. For the record, my most popular courses are ones I built with only the “day 2” tools available. So there’s certainly a case to be made that less can, in fact, be more. 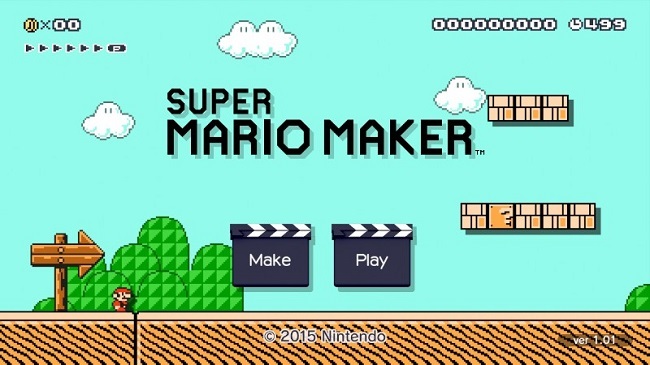 Surprise and discovery are major elements of Super Mario Maker. One of the things that the tutorial teaches you is that you can shake objects to make them change shape. Of course, this doesn’t affect everything in the same way. A Green Koopa will become a Red Koopa, a Chain Chomp loses its stake (allowing it to bounce around freely), and a moving platform will become a falling platform. Not every object will change with a shake, but it’s worth it to shake everything just to see what you can find. Sometimes more than once, even! Also, it’s very important that you try shaking a Muncher. There are other modifiers in play as well, like how super mushrooms can be applied to every monster to turn it into a giant version of itself (and it’s worth trying to feed a monster two super mushrooms at least once). There is a Wing item that can be applied to nearly everything to modify how it behaves (some changes are very unexpected!). Monsters can be stacked on each other to create terrible totems, Bill Blasters can fire way more than just Bullet Bills (including Toads! ), and anything that can find it’s way into the driver’s seat can pilot a Koopa Clown Car. There are endless possibilities, and seeing how all the parts interact with each other is revelatory. However! There are still a few downsides to the course editor. For instance, a lot of staple Mario elements are missing. There are no checkpoints, for example. Maybe SMB and SMB 3 didn’t have those, but they would certainly be a Godsend for the longer, more difficult courses that are being made. In the Super Mario World style, you can do the spin jump, but it no longer allows you to bounce off of things like Grinders and Spike Tops safely. I suppose it’s to maintain some level of consistency, but it’s a big change (and disappointment) for SMW vets like myself. There’s barely any verticality to the editor, going only two screens high, which means that if you want to make a vertically-oriented stage, you have to pull some trickery with warps. The camera is also a little finicky about moving vertically, as well, which can lead to taking some cheap hits if Mario is ascending faster than the camera does. In this age, though, those drawbacks aren’t as big, as they may very well only be temporary. Nintendo has happily begun releasing DLC packs for its biggest games, and there is no doubt in my mind that Super Mario Maker will eventually begin receiving updates to expand its toolset and shore up its few weaknesses. The real questions are when these will start rolling out, and whether those updates are going to be free or not (my money is on free). It’s funny, at first I was none too enthused about Mario Maker. But then they turned it into Super Mario Maker and started showing some of the ways it could bend Mario’s world. It was no longer just a plain old course creator, and that got me interested. Reading the pre-release impressions and watching US Gamer’s The Daily Mario series were what really sold me. I think that the lesson here is that if you want me to buy your product, just have Jeremy Parish tell me it’s good. You may notice that I’ve only really written about the course editor part of the software. That’s sort of on purpose. I had a lot to say about how much fun it is to use! There are (I think) just as many things to say about “Course World,” but I’d rather pen them into a place of their own. This article is specifically about how much I love the Maker portion of Super Mario Maker.